Our Eucharistic Ministers are essential to providing a great experience for our visitors and members who come to receive the nourishment of Jesus in the Eucharist. If you wish to serve in this ministry for our Parish, please contact LeNore Schill at 533-4643. Lectors proclaim the Word of God and lead us in the General Intercessions at our celebration of the Eucharist. If you are interested in serving our community as a lector, please contact LeNore Schill at 533-4643. Boys and girls (fourth grade and older) from the parish are invited to assist the priest at the altar by participating in the ministry of serving. If your child is interested in serving, please contact Stephanie Gruber at 920-533-4441. Ushering is an essential welcoming ministry in our parish. Men and women and high school students are invited to help out in this ministry at our weekend Masses. Ushers help open door, seat guests, take up the offertory baskets and hand out bulletins after Mass. Please contact Stephanie Gruber at 920-533-4441 if you wish to serve in this ministry. Our parish has two weekend choirs. Our Saturday 4pm Praise Choir meets on most Monday nights for rehearsal. Please contact Ann Schlaefer at 920-533-8869 if you are interested in joining. Our Sunday 9am choir is headed up by Bea Mueller. 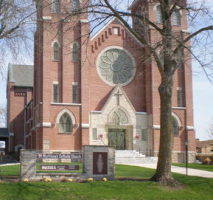 If you are interested in singing with the choir on Sundays, please contact Bea at 920-533-8275. Our parish Religious Education program meets on Mondays September - April for grades 1-8 and the first Sunday of every month for grades 9-11. Grades 6-11 are always especially in need of small group leaders. All materials and preparations are provided for you. Help form the next generation of the Church. Jesus is calling! To give your time and talent for teaching the faith please contact Katie Boehm, Director of Religious Education at 920-960-1550 or email kboehm@sothparish.org.